XMLBlueprint includes numerous intelligent editing features that help you create well-formed, valid XML quickly and easily. It supports Unicode which means you can edit and validate XML Documents in almost any language. 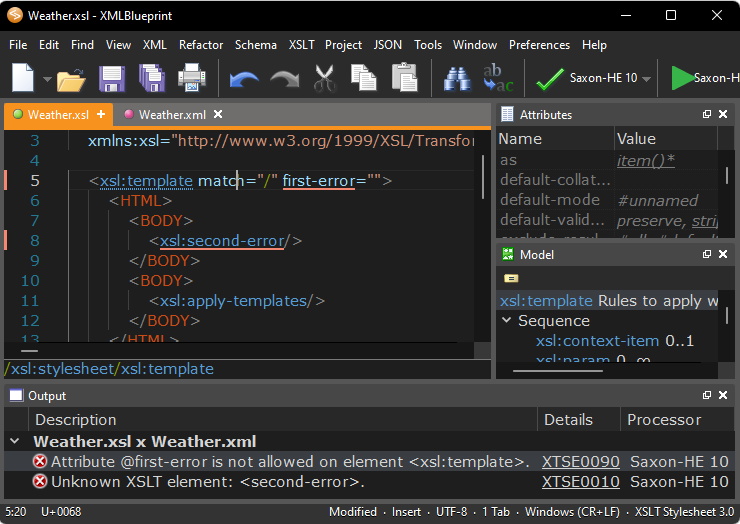 Context Sensitive XML Completion ('Code Completion', 'Intellisense') -- If you have associated your document with a DTD, Relax NG Schema, Schematron Schema, or XML Schema, XMLBlueprint will suggest a list of permissible components based on your current location in the document. These are visible in a context-sensitive dropdown menu that opens as soon as you start typing. You can select the required element from the dropdown menu. The closing bracket is automatically set, as well as any required attributes or child elements. You can adjust these setting in the XML Completion Preferences dialog. XML Folding -- To simplify working with large XML Documents, XMLBlueprint provides XML Folding. Validation -- At any time during the editing process, you can click the validate icon or hit F8 to validate your document. XMLBlueprint reports an error in the Output view below the editor. Clicking the red error message jumps to the error, even if the error is in another document. You can validate against a DTD, Relax NG Schema, Schematron Schema, or XML Schema. 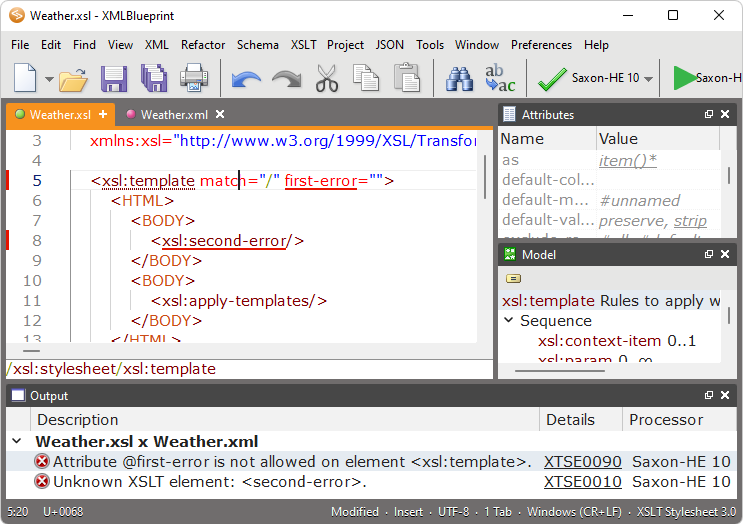 XSLT Transformation -- When you are editing an XSLT Stylesheet, you can easily run the transformation by hitting F9. Fill in the associated XML Document, choose your settings and click OK. You can choose to show the output in the Output view, open the output in XMLBlueprint or save the output to a file. XPath -- Use the XPath view to evaluate XPath expressions. XMLBlueprint provides an easy way to deal with the default namespace. Intelligent XML Formatting -- To make it easier to scan your XML File the Format button reformats your document by indenting element tags. Choose your own indenting in the Indentation Preferences dialog. Unicode & IME (Input Method Editor) -- With XMLBlueprint you can edit documents in almost any (left-to-right) language, including non-Western languages such as Russian, Japanese, and Chinese. FTP and WebDav -- Edit files stored on a remote FTP server or WebDAV server. You can also open files from an SVN (Subversion) server. • XMLBlueprint starts up very fast and preloads the files you worked on last. • Try the Outline for fast selection of nodes in long documents. • Define your own Servers for quick access to your files. • Use the refactoring commands for easy and fast rework on your xml: rename elements, split or join elements, or copy only the text in your xml document. • Make your own Snippets to easily reuse text or XML elements. • Preview your XHTML without saving the file. • Support for OASIS XML Catalogs is provided to speed-up your validation. Thank you for using XMLBlueprint!